Constructed in 1922, 164-168 West 75th St. opened as the Hotel Emerson that year. As reported in the New York Times, 20 January 1922, p. 28, "The 166-75 West Seventy-fifth Street Corporation, James B. Booth, President, has leased through Slawson & Hobbs and Boland & Campbell the hotel now being constructed at 164-68 West Seventy-fifth Street to L. Marshall Thompson for a long term of years at a rental of about $74,000 a year, or an aggregate in excess of $3,000,000. Robert T. Lyons, the architect, will supervise the construction of the hotel, which will be fifteen stories in height and will contain 300 rooms and 176 baths. The hotel will be ready for occupancy about Oct. 1, 1922, will be known as the Emerson, and will be operated by the Emerson Hotel Corporation, capitalized at $200,000. It will be a noteworthy addition to the L. Marshall Thompson chain of hotels, which now numbers the Madison Square, at 37 Madison Avenue; the Langwell, at 123 West Forty-forth Street, and the Westminster, at 420 West 116th Street." Louis Marshall Thompson (1888-1952) was the original owner. Thompson registered for the World War I draft in 1917, when he said that he was born 3 November 1888 in Owego, N. Y. He was employed as a hotel manager by the 37 Madison Avenue Corp. and lived at 37 Madison Ave. 37 Madison Avenue was the address of the Madison Square Hotel. Thompson appeared in the 1920 U. S. Census age 33, "Proprietor, Hotel," living at 33-37 Madison Ave., the Madison Square Hotel. This ad from the New York Times, 29 October 1922, announced the opening of the New Emerson Hotel. It seems, however, all did not prosper for L. Marshall Thompson at the Emerson Hotel. In January 1924 the New York Tribune reported, "The Meister Builders, who bought the forty-two year lease on the Hotel Emerson last week from L. Marshall Thompson, have resold it to the Physicians Medical Hotel Company, acting for a syndicate of doctors, represented by Nathan Wallcoff. The new owners will spend about $250,000 in extensive alterations preparatory to using the structure as a private hospital. The Hotel Emerson is a fourteen-story building, at 166 West Seventy-fifth Street, on a plot 61x100, between Columbus and Amsterdam avenues. It was leased by Mr. Thompson in January, 1922, from the plans at an aggregate rental of about $3,000,000 for the term, control of which is now assumed by the physicians." Conversion of the hotel to a hospital, too, never took place. A month after the January story, the Tribune, 6 Feb. 1924, pg. 21, reported, "The David H. Knott hotel interests purchased from William J. Spain the fee to the Hotel Emerson, at 166 West Seventy-fifth Street, on plot 61x100. Slawson & Hobbs and H. D. Baker & A. Robinson negotiated the sale, which also involved other property in Flushing and Manhattan. The Emerson is a fourteen-story structure, how held under a forty-two-year lease by the Physicians' Medical Hotel Company." This ad from 1930 for the Hotel Emerson mentions that the hotel was under Knott management. In 1937 this story appeared in the Times when the Emerson passed out of control of the Knott chain, "The fifteen-story Hotel Emerson, at 164-168 West Seventy-fifth Street, which was recently acquired at foreclosure by the Harlem Savings Bank, has been sold by the bank to Hotel Emerson, Inc., Hyman Portnoff, president. The hotel is on a plot 62 by 100 feet and contains about 300 rooms. It is assessed at $605,000, and the buyer paid cash above a mortgage of $400,000. Mr. Portnoff operates a chain of hotels in New York City, including the Murray Hill and Gregorian, and recently purchased the Park Plaza, Wolcott, Stratford and Grand Union Hotels. He intends to renovate and refurnish a number of the suites in his new acquisition. ..."
Hyman Portnof (1887-1952) registered for the World War I draft in 1917, when he said that he was born 6 February 1887 in Minsk, Russia. His naturalization petition, dated 1912, added that he immigrated to the U. S. in January 1906. His obituary in the New York Times, 1 July 1952, pg. 23, read, "Hyman Portnof, hotel owner, died on Sunday in Long Branch, L. I., at the age of 62. His home was at 160 Central Park South. Mr. Portnof once owned a chain of twelve hotels in mid-town and upper Manhattan, and operated the Murray Hill Hotel during the last decade before it was demolished. He was born in Minsk, Russia, and came to this country in his boyhood. Starting as a builder's apprentice, he became a general building contractor and entered the hotel business after the first World War. At his death, he owned the Robert Fulton, Cameron and four other hotels. Mr. Portnof was treasurer of the Grand Street Boys Association, a post he had held for more than ten years, and vice president of the Maimonides Hospital in Brooklyn. As chairman of the hospital's building committee, he had worked toward the completion of its new building. He also was active in the United Jewish Appeal. He was a member of the Bay Ridge Jewish Center and Midian Lodge of Masons. Surviving are his widow, the former Estelle Nadler; two sons by a former marriage, Lawrence and Sidney, and four grandchildren." In 1959 the Emerson Hotel became the Hotel Lincoln Square. It stayed in business under this name until approximately the early 2000s when the property was converted to rental apartments. At some point in the 1980s the building also began to be called the Parc Lincoln. 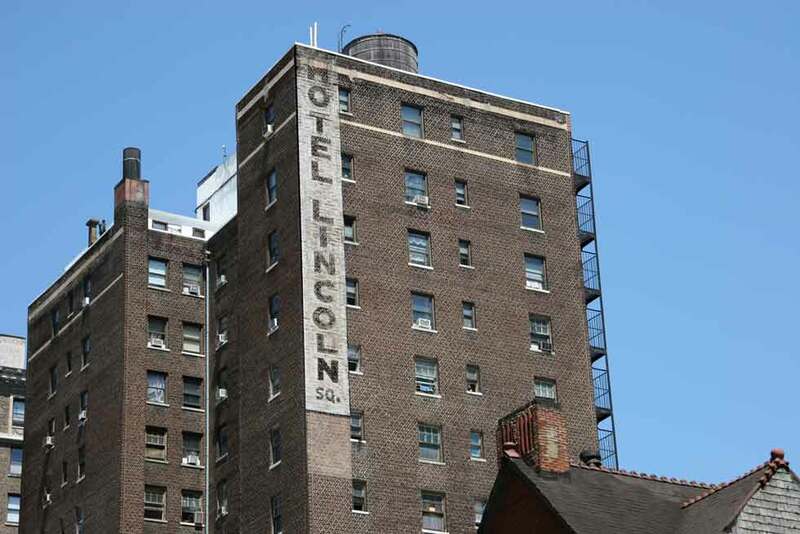 Prior to 1959 there was a Hotel Lincoln Square located at 111 W. 68th St. Possibly this business moved uptown to 75th St. at that time. An undated webpage accessed in April 2015 states "SBD [Simon Baron Development] has acquired 166 West 75th Street. The property is an 81,000 square foot, 200 unit building with ground floor retail located on West 75th Street between Columbus and Amsterdam Avenues. SBD acquired the property out of foreclosure through a sale arranged by HFF." Another Simon Baron Development story indicates this acquisition occurred in 2013. 164-168 West 75th Street was designed by architect, Robert T. Lyons. The wikipedia article on Lyons lists about 30 notable designs by Lyons in New York, including the St. Urban Apartments, 285 Central Park West (1905); Wellington Hotel, 871 7th Avenue (1929); and 35 West 90th Street (1931). OWNER/DEVEIOPER: 166 West 75 Street Corp.